Recommended to: Any readers who like books that are quick moving, and have a psychological edge to them. 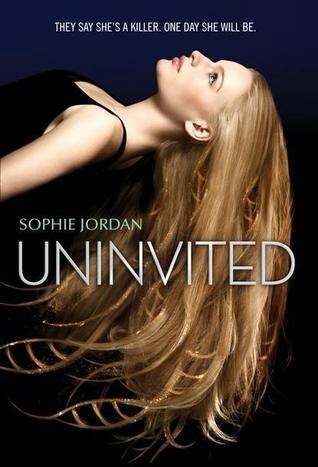 Uninvited skyrocketed up my to-be-read list when I first heard about it. Not only am I fan of Sophie Jordan's writing style, but the whole idea of HTS sounded eerily plausible. I love getting lost in a book with a premise that could actually happen. It adds that extra level of tension to the whole read. What I'm really rambling about is this: I had high expectations. I went into this book intending to love it from cover to cover. It just didn't exactly happen that way. First off, the story is told from Davy's perspective. This isn't an issue for the most part. Davy's story, what with her life being completely turned upside down by HTS, is actually rather interesting. I was right there with her as she tried to cope time and time again, as more insanity fell onto her head. The problem is that the reader isn't really treated to anything beyond what Davy knows. No description of where the gene was discovered, how it's tested for, or even how it was truly affecting people outside of her hometown. There are snippets here and there that try to make up for this. Newspaper clippings, letters, etc. However I still felt like I was missing some very useful information. The other problem I had was with the romance. I'm sure we all know that the majority of YA has romance in it. I don't mind that, trust me. I love seeing two people come together under circumstances that would normally break them if they were apart. Still, neither of the two boys who came into Davy's world felt realistic to me. They felt like paper dolls. Boy A with his sweet personality who is, underneath it all, not the boy he seems to. Boy B the exact opposite, someone who looks dangerous and has a warm center. I honestly didn't like either of them. I also couldn't get behind Davy's paranoia at what a guy that she just met thought of her. It was a bit much. One thing I will say is that Davy was a strong character when it counts, which I appreciated. The second half of the novel gave me a much better appreciation for how tough she truly was. I just wanted a bit more. More explanations, more action, just more of it all. So, yes I'll be back to read whatever comes after Uninvited. The ending left a lot undone, and my book-addled brain won't let that go.